THE OWNER OF a blind dog who fell into the River Liffey yesterday said it was just on impulse that he jumped in to save his pet. 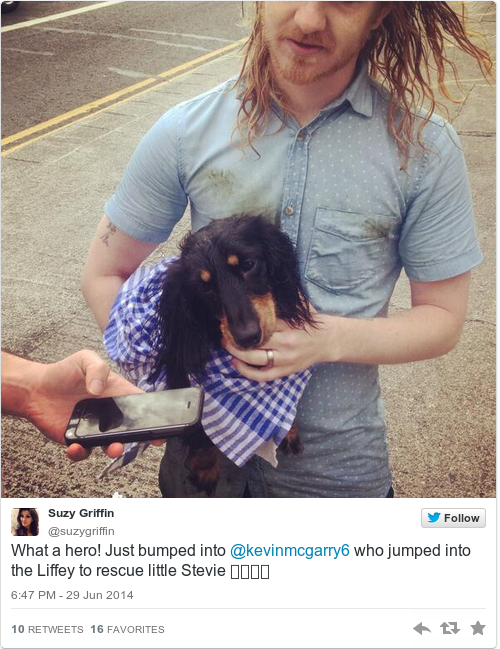 Speaking to TheJournal.ie, Kevin McGarry said his dog, Stevie, went over to two women at the bank of the river. “He was just sniffing around and the next thing he leaned over the edge and his whole body went over. It all seemed to be in slow motion,” said McGarry. McGarry said they tried to call out to him in the water but he wasn’t responding. “I just jumped,” said McGarry. “I am not the best swimmer myself, so that was pretty scary. I just grabbed Stevie as I could see he was starting to sink. I flung him over to someone to catch him,” said McGarry, who said he then felt he was getting in to difficulty as he couldn’t hold on to Stevie and get out of the water. Stevie is blind, explained McGarry, who said he follows his brother Oscar everywhere. “Oscar wears a bell around his neck, so Stevie follows the bell. His brother Oscar is like his guide dog,” he said. He said he has had the two dogs for just over two years. “We only went to get one dog and we picked Oscar, but then we saw his brother and were told he was blind, we just had to take him too,” he explained. Email “Man jumps into River Liffey to save his blind dog”. Feedback on “Man jumps into River Liffey to save his blind dog”.